Life intervened and I forgot all about this movie until the book review popped up on the blog and I saw that I said I was going to see the movie as soon as it came out. So I'm only a day late. 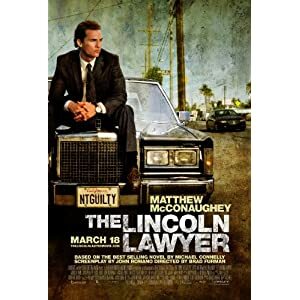 The screenplay for The Lincoln Lawyer was much better than the one for Blood Work. Muuuuch better. It followed the book almost exactly with very few changes and surprisingly left very little out. The film had a very 1970s look to it, which I found interesting since it is obviously set in present day. It might cut through some of the earlier scenes a little fast, as there is a lot of story to get through. I had no trouble following it, but I had recently read the book. I don't know what it would be like for someone who didn't know the story. Let me know.